Halloween is Coming! The countdown has truly begun and my son is so excited he can’t contain his joy. He is constantly asking me how many days until he can wear his costume, eat candy, play with his cousins, trick or treat and the whole enchilada. I wanted things to be perfect so I developed this simple Halloween Trick or Treat Checklist! Stay safe this Halloween with the kids while Trick or Treating. 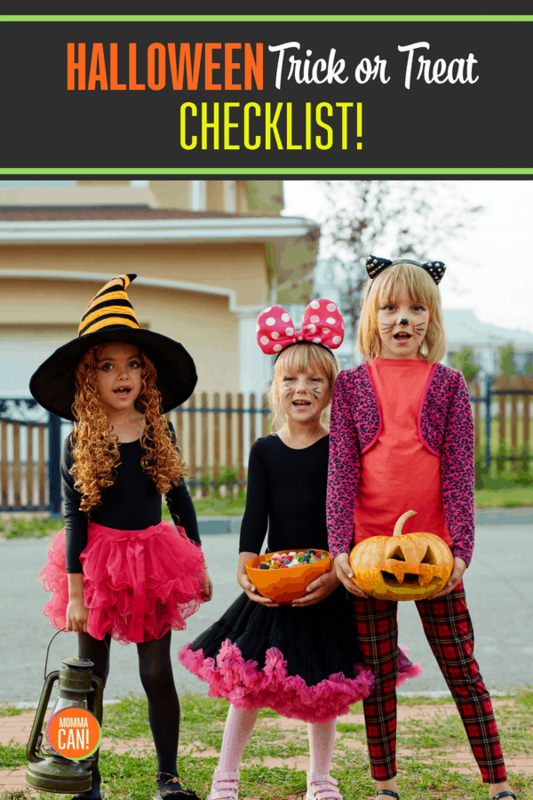 Grab our free printable checklist and plan your Halloween Trick or Treat adventure. This list also comes with a teen section for trick or treating with their peers. Safety first this Halloween! 1. Every Halloween we have crockpot chili dogs. Meaning, I make my Mean Momma Chili and add hot dogs during the last half hour or so to heat up. So good with chopped onions and shredded cheese. The perfect fall quickie dinner, especially Halloween which is such a long day for young children. 2. I have my mom-pack ready with a flashlight and a glow stick for the little guy. He loves the idea of anything green and glowing to swing around or wear. 3. I always leave a note to myself to charge my camera and my cell phone the night before. ( always plan for a camera failure of some sort) If you happen to have spare batteries for your camera to bring them along fully charged as well. 4.If you live near a mosquito or even think one might be flying around someplace then pack some child-safe repellant. Nobody wants to ruin their chocolate buzz with an itching episode. 5. It might get cold on Halloween night, and it will probably rain if the weatherman says it will be sunny and clear all day. Pack jackets, umbrellas, hats, gloves, boots and toilet paper. You never know when you are going to be cold, wet, and you never leave home without some backup T.P. I hope you have a really roomy handbag or backpack for all this stuff. Don’t forget your camera (smartphone), candy bag, or your children. Have Fun! I admit the first list was serious but a little bit silly. After all, what is life without a few giggles? But let’s get serious. Planning is one of the best ways to stay safe while trick or treating. The biggest one in our house has always been, never go into someone’s house and treats are for eating at home! I keep two or three candies in my bag while en route to ease those candy anxieties. I check candy as a worry wort mom and I will probably be sneaking over to my adult’s son’s house this year and check his candy as well! It is just how I roll. Creating a list of guidelines for your kids on this special night is essential. As are items to take along for the adventure. I have a FREE printable of the items listed below so that you can print and share with friends. If you are going Trick or Treating with your kids here is a simpler list of items needed for your safety and fun. 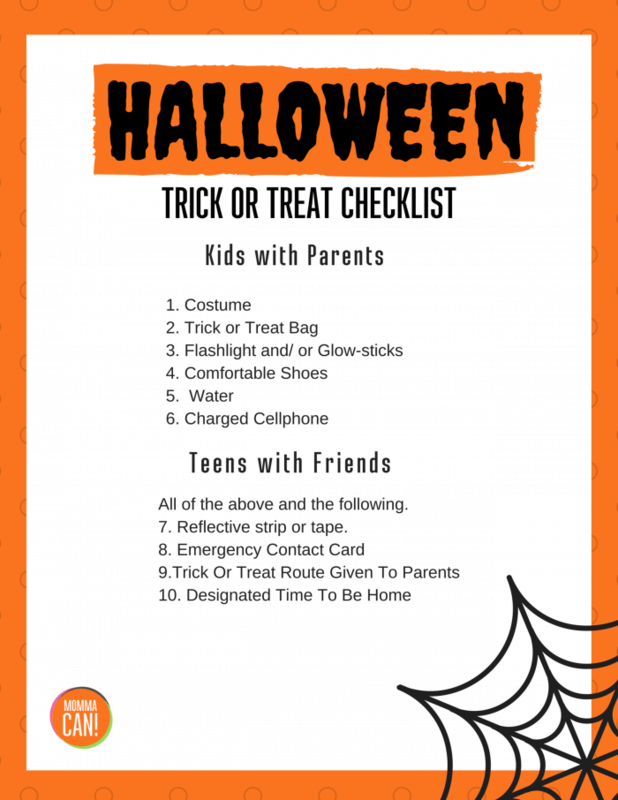 If you are letting your teen go trick or treating with friends here is a simple checklist to get you started on having their adventure be as safe as possible. Please add what you feel will be best for your family. These are just very basic. Bonus! 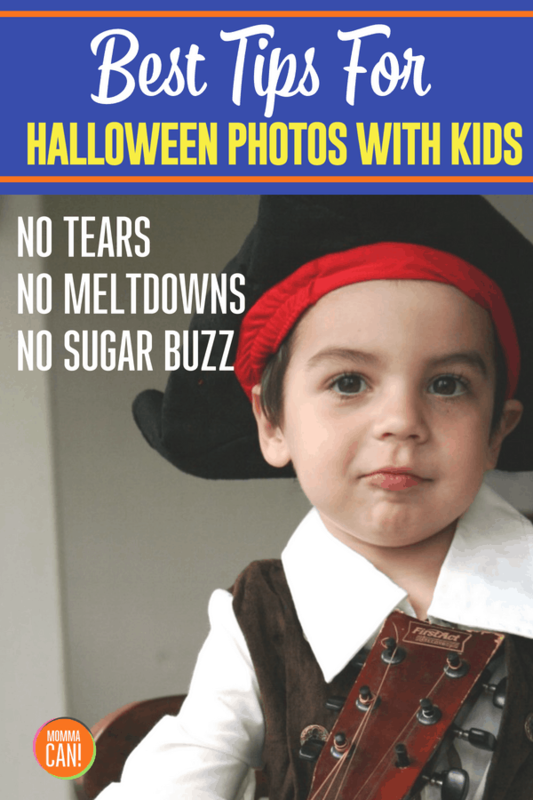 See our tips on taking great Halloween Photos with the kids! I loved your post especially about raincoats etc. Around here, they changed Halloween to tonight instead of tomorrow because of the chance of rain. I commented on our local news channel, what happened to raincoats and hats? And rain is really not an oddity around here so we all should be used to i.
I love the whole idea of trying to dress kids up, keep them up late and fill them up with sugar. Its just asking for chaos, rain just adds to the charm. 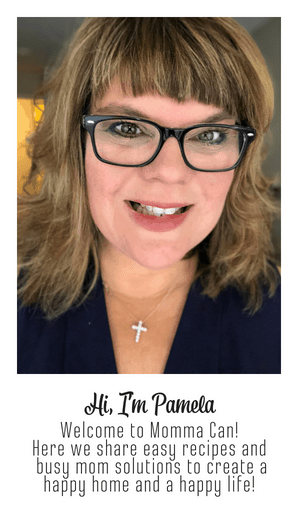 You are such an awesome mom! Happy Halloween. Have fun and be safe!